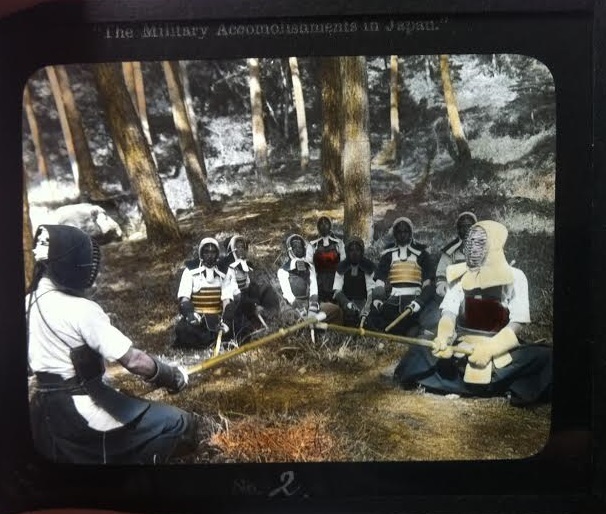 A hand colored magic lantern slide, produced in Japan, showing both Judo and Kendo. Source: Author’s Personal Collection. When introducing topics like the transnational translation of the martial arts, the construction of popular beliefs about Asian culture through images of violence, or even the reduction of hand combat’s once radical message to yet another product within western consumer markets, one might be forgiven for assuming that the upcoming post would focus on the place of martial arts films in popular culture. Indeed, it is hard to imagine how martial arts culture, in either the West or Asia, would have evolved without this highly visual medium. Almost all of us were first introduced to the martial arts through the flickering images of film, television or (more recently) videogames rather than by direct bodily experience. It was these highly stylized encounters, often playing on orientalist yearnings, which planted the seeds that would later sprout into a more dedicated investigation of the martial arts. Nor does it seem that any amount of personal experience can ever really free one from these media images. While our engagement with these discourses often becomes richer and more critical, they continue to speak to core cultural needs and hence frame our experience of the martial arts in socially meaningful ways. Yet this process was not simply invented in 1960 when Sophia Delza first demonstrated Taijiquan on American Television. Nor did it spring forth in 1973 when Bruce Lee’s “Enter the Dragon” set off a “Kung Fu Fever” that forever changed the place of the martial arts in Western popular culture. All of these themes predated the actual invention of modern cinema and television. When studying magic lantern slides, mass produced during the late 19th and early 20th century, one can see the emergence of many of these same trends. An awareness of, and certain theories about, the martial arts seems to have been baked into the modern media discourse on Asian cultures from its very foundations. Magic lantern shows, both in public venues and private homes, were a popular form of visual entertainment in the late 19th and early 20th century. While this technology had existed since the 16th century, the mass production of better lighting elements, cheaper glass and the creation of new photographic techniques led to an explosion of images meant to both educate and entertain a public obsessed with life in far off and exotic lands. In an era when travelogues were best sellers, the magic lantern became a way for middle-class households to bring the exotic corners of the globe into one’s own home or community. Magic lanterns were also frequently used by educational, community, fraternal and church groups. Like the ubiquitous public lectures that were also popular during this period, lantern shows were notable pioneers of “edutainment.” This marketing of often fantastic or orientalist images under the guise of ethnographic enlightenment is hardly a unique phenomenon. Any cable television package today will offer at least a dozen channels whose names suggest an educational purpose, yet closer examination of their shows reveals that it were designed to appeal to more sensationalist tastes. The martial arts have proved to be a staple of this sort of “educational” programing. Just as advertising budgets drive many of these trends today, in the Victorian and Edwardian era it was not all that uncommon to find firms commissioning magic lantern slides and distributing them to potential customers (often free of charge) as a means of getting their message out. Indeed, many aspects of the modern film and TV industries are prefigured in the market for these shows. In addition to the slides themselves, collections also often included a script that either told a story or provided some sort of narrative continuity holding the whole display together. These booklets also became a vector for various advertising efforts. In the following post we will take a closer look at a few images recording the state of the Japanese martial arts in the pre-WWI era. This discussion will ask both who created these images and what they were meant to communicate to their intended audience. We will then consider some possible reasons why images of Chinese martial artists tend to be much rarer than their Japanese counterparts, even though China itself was a relatively popular theme with magic lantern enthusiasts. 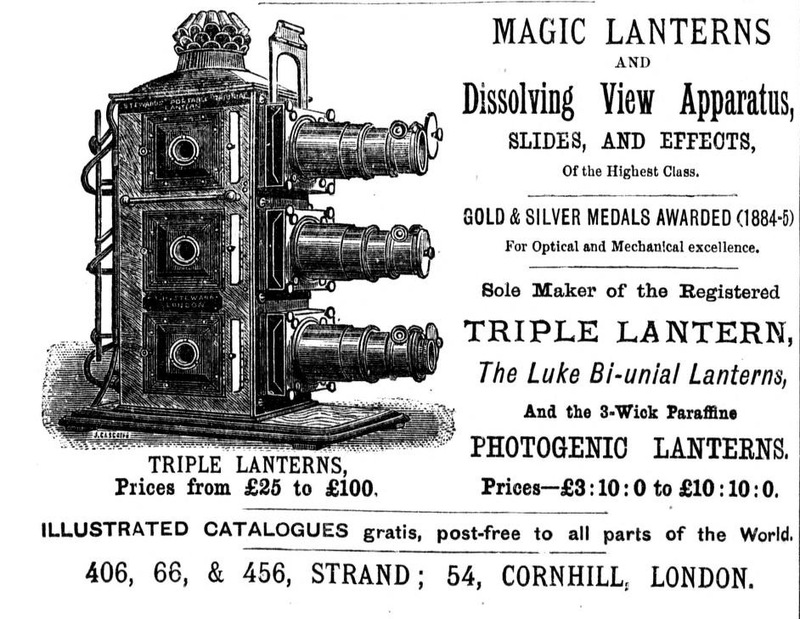 An advertisement for an elaborate magic lantern slide projector. Source: Wikimedia (public domain). Magic lantern slides covered as vast range of topics that ran the gambit from purely educational (records of museum collections) to entirely recreational. Some of the most popular subjects seem to have included collections of fairytales and architectural tours of far off cities. Masonic lodges also made use of magic lanterns and some of the slides produced for them have an almost surreal quality. Scenes of daily life in Japan also appear to have been common. Given the popularity of travelogues recounting journey’s to Japan this is not entirely unexpected. Indeed, the possibility of engaging in virtual travel to exotic lands seems to have been one of the main attractions of this early visual medium. However, there might be another factor that helps to account for the abundance of Japanese slides, besides sheer demand. By the turn of the 20th century Japan was producing a number of talented photographers who produced prints, postcards and glass slides for a growing consumer market. This was augmented by an expanding international tourist trade in a number of larger cities. Thus by the first decade of the 20th century indigenous Japanese photographers were producing many of the images that came to represent their country in the west. A large number of these focused on traditional customs and quaint, stereotypically “oriental,” gardens, temples and homes rather than the nation’s quickly expanding industrial prowess. At first cut one might be tempted to say that these images were simply feeding into a western demand to continue seeing the Japanese as an “exotic other” rather than a peer competitor within the family of nations. Yet when one considers the neo-traditionalism that dominated much of Japanese popular culture in the early 20th century, the meaning of these pictures becomes somewhat more complicated. The rise of martial arts, such as Judo and Kendo, and resurgent interest in “traditional” aesthetic pursuits including such as bonsai (which actually underwent something of a technical and stylistic revolution in the early 20th century), indicate that Western tourists were not the only ones consuming a re-imagined image of Japan’s martial past. The image at the top of this post is typical of what was being produced in the period for both domestic and international consumption. In fact, it is quite similar to a couple of postcards of the same era which showed high school Judo and Kendo clubs in training. Very often the training halls in these images are smaller than one might expect. At times students were arranged in orderly ranks, posing for the photo, but the better images often show a hive of activity. This image is particularly nice as it combines views of both Judo and Kendo in a single place. During the first few decades of the 20th century Kendo images appear to be much easier to find than Judo or Jujitsu classes. The younger students gathered outside of the doorway look as though they might be wearing school uniforms. This particular image is on a large glass slide that measures approximately 4 by 3.25 inches with tape around the outside of the plates. The photograph that the image is based on was originally black and white, and the slide itself was later hand tinted. This probably helps to explain the somewhat exotic color choices evident in some of the training uniforms occasionally encountered in these images. This photo probably dates to sometime during the first decade of the 20th century. Tamamura’s studio was actually located in Yokohama. He produced a number of different sorts of photographs for the tourist trade (including magic lantern slides) and his specialty appears to have been hand colored albumen photographs. Terry Bennett, the author of Early Images of Japan, notes that Tamamura opened a second location to market his goods in Kobe sometime between 1900 and 1903 (when it was first listed in a local directory). Apparently Takagi was the manager who was hired to run the shop. In either late 1903 or early 1904 Takagi actually bought-out the branch and is thereafter listed as the proprietor, but there was no change in the images being sold. He only began to affix his own name and the Kobe location to these photos sometime prior to 1913. All of this helps to establish both when the original photograph was taken (by Tamamura prior to 1907) and when it was marketed to the foreign (presumably English speaking) tourists in Kobe, sometime after 1913. We can further narrow down the date by noting that in 1918 the Takagi Photographic Studio and Art Gallery in Kobe is known to have published a color collotype book titled “The Military Accomplishments of Japan.” This collection of 20 hand colored images was bound between silk covered boards. The English language captions of the photos narrated readers through a visual tour of the Japanese martial arts as they existed (and were imagined) in the early 20th century. The collection included nine images of fencing (all featuring the same group of martial artists seen in the previous slide), three pictures of halberd fighting, two images of Judo, one photo of traditional archery and finally five images of the “Warriors of Old” (individuals dressed in the armor and weapons of Samurai). Many of the photos were staged in outdoor environments, though a Judo dojo also makes an appearance in the collection. I have not been able to find a complete series of magic lantern slides for the “Military Accomplishments of Japan.” Still, the 1918 collotype book strongly suggests what the rest of the set looked like. My guess is that the two collections probably showed substantial overlap, if not actually being identical. The one obvious difference is that the printed pictures included English language captions which helped to frame and explain the Japanese martial arts to an international audience. Of course the Samurai in ancient Japan never actually practiced Judo. Nor, for that matter, did they train in modern Kendo. These fighting systems, like so much else in the 20th century’s martial arts, grew from equal parts ancient techniques, modern innovation and invented tradition. 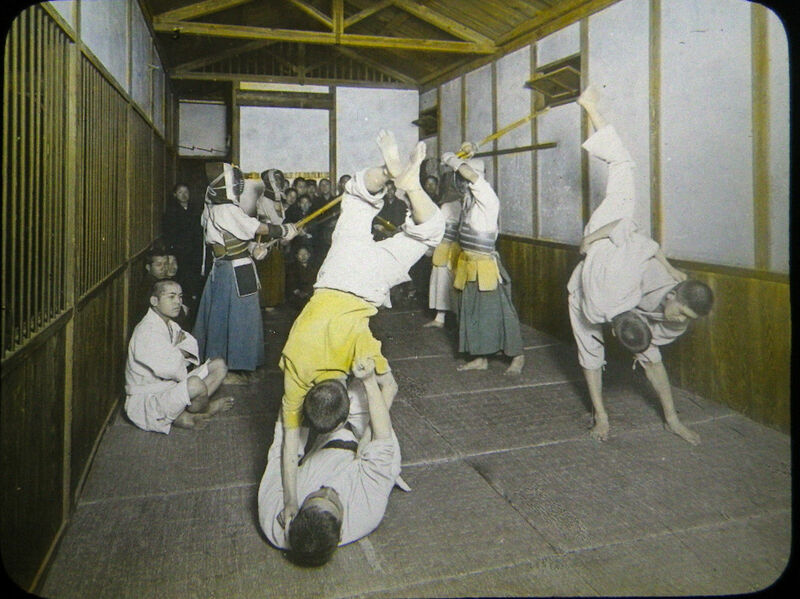 As a distinct system Kanō Jigorō’s Judo doesn’t predate the 1880s, and it (along with Kendo) was only introduced into public schools in the 1910s. In other words, the practices in all of the slides and photographs discussed here, and even the types of students seen, are actually quite contemporary. Nor would that come as much of a revelation to any older martial artists living in Japan during the 1910s. 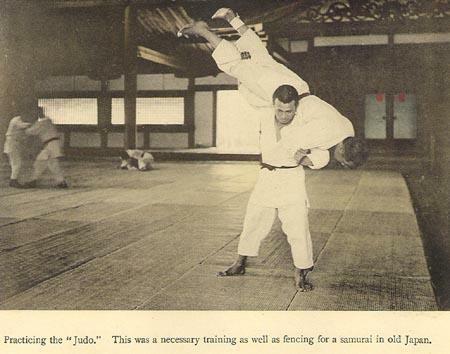 Even some of the more informed individuals in the west realized that Judo was in many ways an innovation rather than a simple continuation of Japan’s feudal past. Still, this particular photograph is a fascinating example of the emergence of “invented tradition” within popular culture. The contemporary social value of activities such as Judo and Kendo, and their ability to connect Japanese citizens with their imagined past, was emphasized by the final five images of Samurai in their traditional armor. From a historical standpoint one might see these photos as a lost opportunity as they do not really provide any insight into the early 20th century Japanese martial arts. Yet on a more ethnographic level their presence frames everything that came before, giving it cultural meaning. The Japanese government meant for the martial arts to be much more than a convenient grade school physical education program. These practices were intended to lead individuals to a very specific shared vision of the past and what it meant to be Japanese today. So why market such photos to tourists? Clearly they were not interested in a primer on Japanese nationalism. Here we see a strange confluence of interest between Western orientalist notions of the Japanese and their own attempts to craft a more robust type of nationalism that would strengthen the state. One suspects that having Western consumers buy into this sort of essentialist myth-making may have helped to validate and legitimize the effort at home. Conclusion: Why are Chinese martial arts images rare? By the 1920s some martial arts reformers in China were also attempting to use their traditional fighting systems to bolster nationalism. And China probably had more international tourists and travelers than Japan. These individuals sent home postcards, took snapshots and in an earlier era even commissioned striking watercolor paintings of China’s various martial artists and soldiers. So where are the kung fu themed magic lantern slides? The short answer is that I simply do not know. China was actually a relatively popular subject for magic lantern manufacturers. It is not that difficult to find pictures that are somewhat tangentially related to the Chinese martial culture. Images of public beatings and punishments at the local Yamen occasionally turn up (most of which are paintings rather than photographs). I have seen a few slides showing Chinese opera performances. Likewise images of soldiers and their exotic weapons (swords, spears, muskets) can be found. But I personally have yet to come across a really clear image of a Chinese martial artist on a magic lantern slide. I am not saying that none exist, but they do seem to be rarer than their Japanese counterparts. One suspects that much of this comes down to a question of timing. While different types of magic lantern slides were popular up to the 1940s, the heyday of the sorts of images that we have been reviewing occurred between the final decade of the 19th century and the first of the 20th. Note that the actual images of the Japanese martial artists seen above were probably produced between 1907 and 1913. The fact that the Japanese arts were starting to undergo their modern reform process more than a generation prior to similar shifts in China suggests that they may have been better positioned to take advantage of this visual technology when it was at its peak. The Jingwu Association certainly distributed a lot of photos of Chinese martial artists in the early 1920s. Yet by that point their efforts seem to have focused on mass publications (journals and newspapers). The photographic department of the Shanghai Jingwu chapter even pioneered the production of an actual martial arts film to better capture the dynamic nature of the Chinese fighting styles. One also suspects that consumer demand played into this. By 1900 the idea of the Japanese “warrior spirit” was firmly planted in Western popular consciousness and generally admired. The Boxer Rebellion also brought accounts of the traditional Chinese fighting arts into western households, but with a very different reception. Rather than seeing these fighting techniques as a technology that might be worthy of study (like Judo) the public seems to have viewed such practices in China as an outgrowth of an ancient and superstitious past better left behind. Not all westerners who came in contact with the Chinese martial arts shared this view, but they never gained the sort of domestic following in the West that Judo and Jujitsu did during the early years of the 20th century. Market forces, in the form of supply and demand, govern the production of any good. It would be a few more decades before both of these variables favored the Chinese martial arts. By that point elaborate magic lanterns shows were becoming a quaint curiosity. The visual culture of the middle and later parts of the 20th century would be ruled by film. It was the Hong Kong kung fu films of the 1960s and 1970s that would finally bring the Chinese martial arts within the grasp of western consumer culture. Still, our review of these early 20th century images suggests some interesting similarities in how the Asian martial arts were imagined by western audiences. If you enjoyed this post you might also want to read: Conceptualizing the Asian Martial Arts: Ancient Origins, Social Institutions and Leung Jan’s Wing Chun.